Used on interior flush mounted doors and panels. Fits a 5/8" x 3-1/2" mortise, 3/4" deep. Johnson Pocket Door Pull, Dummy, Suitable For Use With: 1-3/8 in Door Thickness, 2-1/8 in Diameter, Bright Brass Plated Fits doors 1-3/8" to 1-1/2" thick. Pre-assembled for doors opening left to right. Plates are reversible for doors opening right to left. Overall size: 2-3/4"H x 2-1/2"D.
Reversible handings with pull-out edge tab. Will fit 1-3/8" thick doors only. Mortise installation. Mortise latch unit with privacy lock feature, and pull-out edge tab. Reversible; fits 1-3/8" thick doors. Latch engages and disengages by rotating round thumb turn. 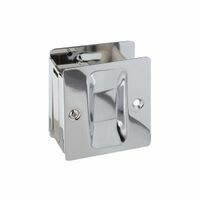 1-3/8"W x 2-3/4"H. Sliding door lock and pull for passageway (pocket) doors; reversible; adjust from 1-3/8" to 1-3/4" thick doors. Contents: 1 lock and pull; 1 set of installation screws. Pocket Door Pull. Pocket door mortise latch unit. Pull-out edge tab. National Hardware Pocket Door Pull, Series: V1950, Suitable For Use With: 1-1/4 - 1-5/8 in Thick Doors, Solid Brass, Chrome Plated Fits doors from 1-1/4? to 1-5/8? thick. Includes flush pull on edge of door. Manufactured of solid brass for maximum corrosion resistance. Sliding door combination pull for passageway (pocket) doors; reversible; adjust for 1-3/8" to 1-3/4" door; plates are polished solid brass. Latch engages and disengages by rotating round thumb turn. Fits doors 1-3/8" thick. Designed with latching mechanism to lock door. For safety purposes, door can be unlocked using screwdriver. Fits doors 1-3/8" to 1-1/2" thick. Pre-assembled for doors opening left to right. Plates are reversible for doors opening right to left. Dimensions: 1-1/2" D x 2-1/4" H.
Deluxe pocket door privacy lock and pull; wide easy grip design; mortise installation; non-handed. Latch engages and disengages by rotating round thumb turn. 2-1/2" wide. Used on pre-drilled pocket doors. Latches but does not lock. Easy installation. Includes fasteners. Used on pre-drilled pocket doors. Latches but does not lock. Easy installation. Includes fasteners.